After I picked the topic as well as the basic design for my poster, I sat down to create the very basic version in After Effects (first picture). I cared less about the colours and the details as the positions and shaping. I liked the idea of using blue and white to create an hourglass like look. 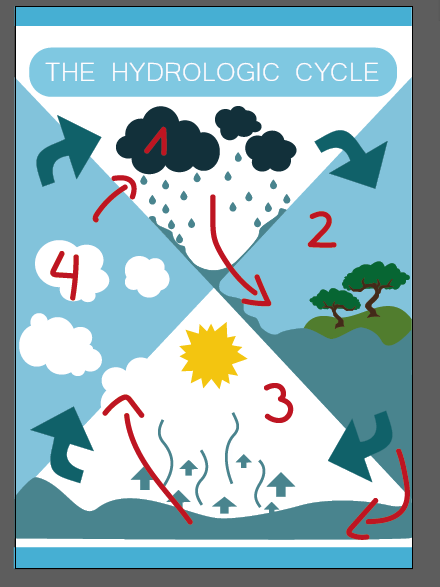 After all the water cycle is all about time and I figured that the hourglass would be a nice way to underline that. Another thing that I liked about my design was the part about the water being in a constant flow, like it is in reality (second picture). I visualized that, connecting the water from each and every part of my cycle by a different kind of flow. Looking at it closer, you realize that the rain from the first quarter flows into the lake in the second one, which again, ends up in the ocean. From there, it vaporizes into clouds which float through the fourth quarter back into the first where the water rains back down. Then I took the basic design to my seminar session, to get some advice about further developments and a little bit of feedback about what I had done so far. Together with my seminar teacher, I talked about the use of space and the possibility of removing the blue frame lines to either resolve the problem of it being too crowded or maybe adding a small amount of information in form of text. Also I realized that I had to change the “space holder sun”, I created into something more fitting and that shading and details were needed. I experimented with gradients and I considered using them for the background.